Hi! 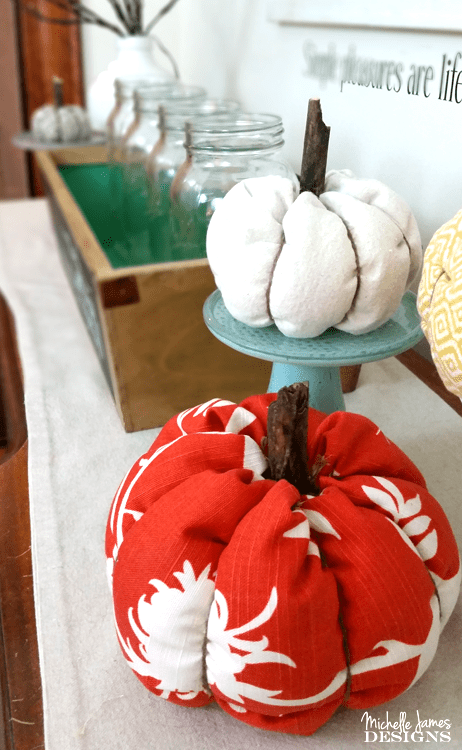 I am excited about these DIY fabric pumpkins. 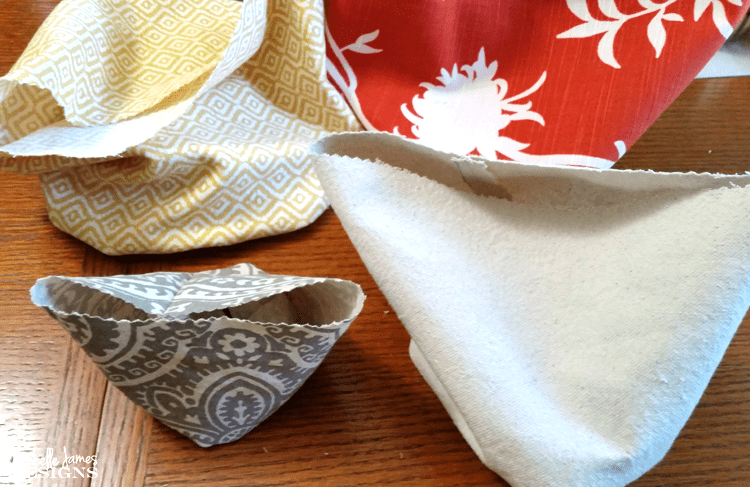 This is part of my Crafty De-Stash Challenge and this month I decided to use up some of my fabric stash. Each month a group of bloggers and I are challenged to use what is already in our craft stash and create something. Last month I made my Kitchen Organization Board and I love it. This challenge is hosted by Megan at C’mon Get Crafty and I appreciate her for putting it together each month. For August I thought I would use up some of my fabric. This is by no means all of my fabric, but I wanted to choose fall-ish colors but not the typical fall colors yet. I want to “ease” into fall. I am not ready for it yet. 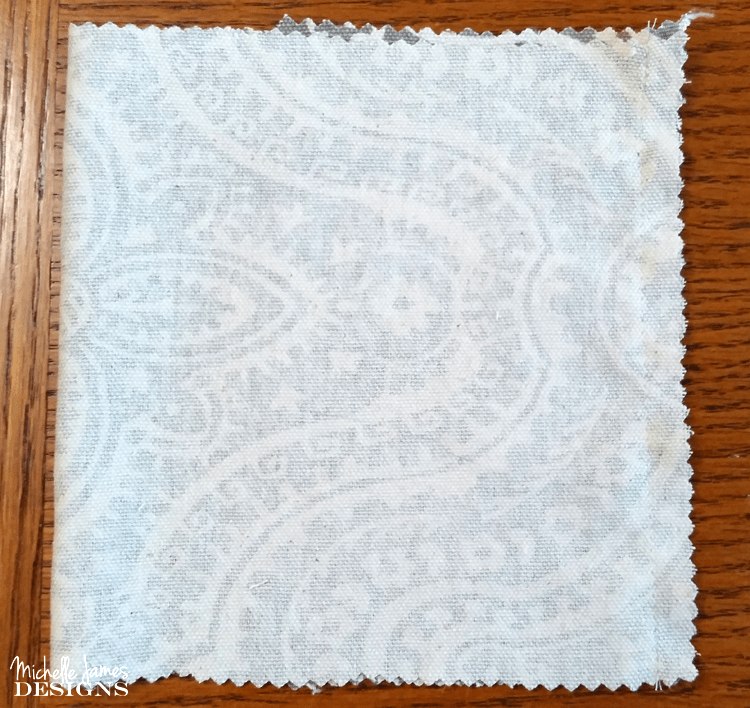 The fabric on the top was what I just used on my Vanity Chair Makeover and there is a piece of drop cloth in there and the rest were for throw pillows that have not been made yet. We start with rectangle pieces. 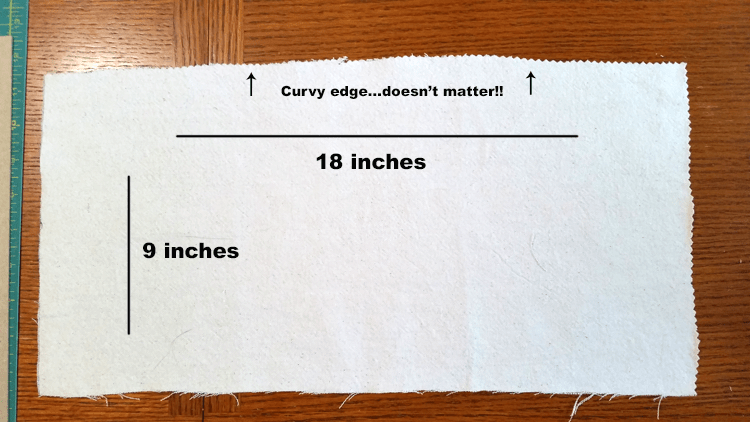 The width needs to be twice as as long as the height. I used three different sizes, 24 x 12, 18 x 9, and 12 x 6. Don’t worry about each side being perfectly straight. They will be gathered up and no one will be able to tell. See how crazy my cutting was? Fold the pieces right sides together and stitch up the side. 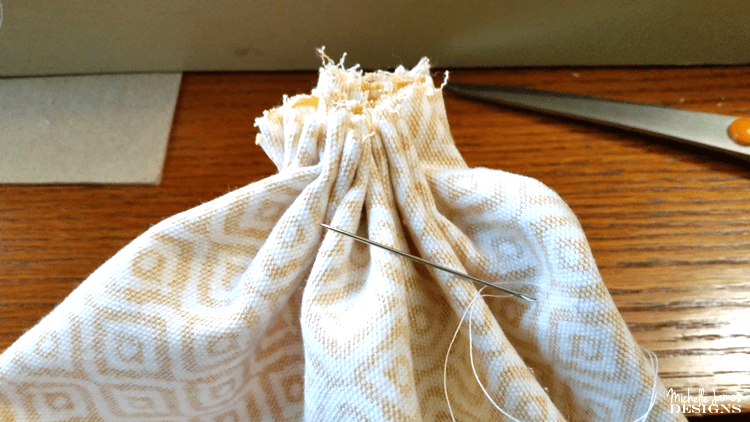 Using one of the regular, smaller size needles and some thread, add a running stitch all the way around the bottom of the “tube” of fabric. With the needle still attached gather the fabric to close the opening. Use the needle to knot the thread a few times. Then turn it right side out. Stuff the pumpkins with the fiberfill. I didn’t over stuff though. Using the smaller needle and thread do another running stitch and gather to close the opening at the top. Before I knotted it I added some stitches to make sure all of it was sewn shut. Now it is time to add the twine around the edges. I took the easy, lazy route but it worked just fine. Using the twine, wrap one piece around the pumpkin. Basically so you have two halves. Pull it tight and tie a couple of knots at the top. Then do it again splitting the pumpkin into quarters. Then two more times splitting those quarters in half. 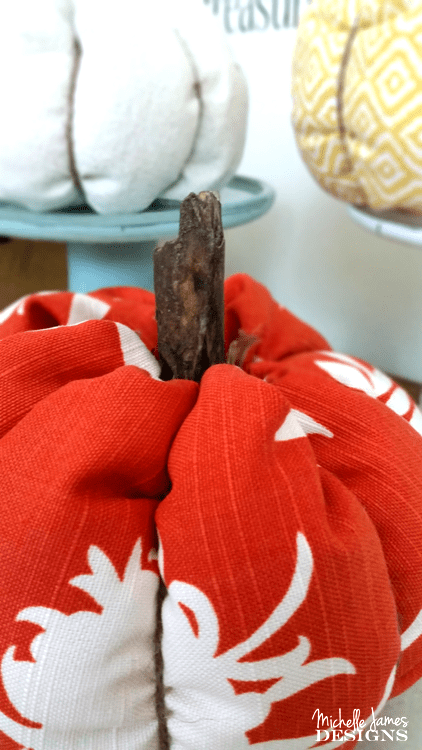 You will have added 4 pieces of twine around the fabric pumpkin. This is the hardest part especially if you don’t have the longer needles…and I didn’t. In order to shape the pumpkin and squish it down a little bit a tie is needed from top to bottom. So thread up the long needle and punch down from the top, through the entire pumpkin and out the bottom. Then back up again. Repeat this process a couple of times pulling the thread until it is not round anymore and knot the thread several times. Add the stems. I found a decent branch outside and broke it into small pieces. Fill the top with hot glue and place the stem in. I just held it in place for a few seconds and it was perfect! All finished! What do you think? They look pretty cute on my mini cake stands! If you like it don’t forget to pin it! 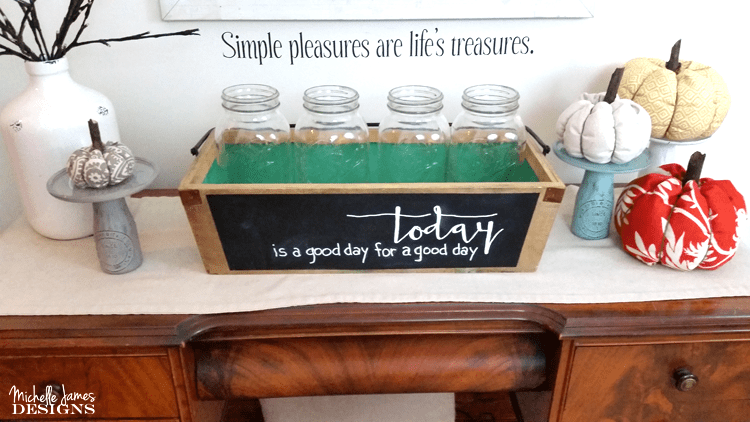 Be sure to check out all of the other blogs and their wonderful crafty de-stash projects too! And if you would like to watch my Facebook live video showing how to make one of these pumpkins you can find it here! Super cute, Michelle, I love the fabric you choose too. I’d love to try and make one myself! Happy Autumn! You should Carolann! They were really fun and I love the way they turned out! The fabric pumpkins are so perfect. I like the soft colors. No wonder you had a shop! Thanks Sue! They were fun to make. I think I may make more. Thanks Heather. I think they turned out pretty cute and I agree about the cake stands. 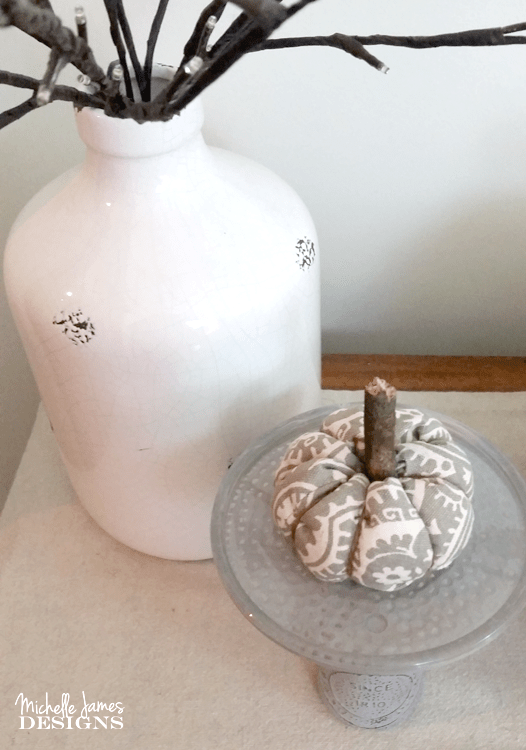 I love fabric pumpkins & yours turned out so cute! They look adorable on your cake stands! Thank you Michelle. I thought they would be fun on the cake stands and I love them. LOL! They didn’t take me very long and I like a quick crafty project. Those are cute & I’m with you, I’m not ready for Fall yet! I like the transitioning you used with not using Fall fabric yet. Thank you Florence. 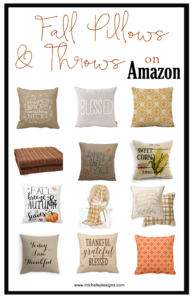 This fabric…except for the orange one goes well with my decor so I can maybe leave them out. I do love the way they turned out! Thanks for stopping by. I made similar fabric pumpkins a couple of years ago but I will say yours look so much better and have better details. Love them. 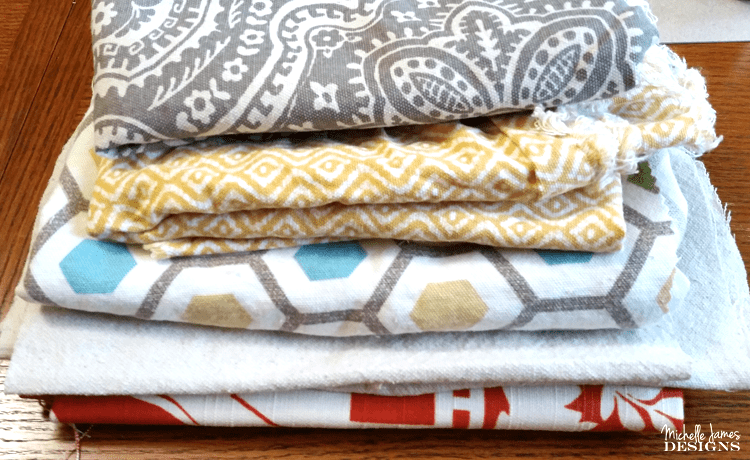 I have pinned these to try out this year to use up some of my fabric stash. Thanks for sharing. Thank you Donna and thanks for the pin too. They turned out pretty cute for my first crack at them. I would love to make some from flannel shirts and/or sweaters too. Oh, I love these. 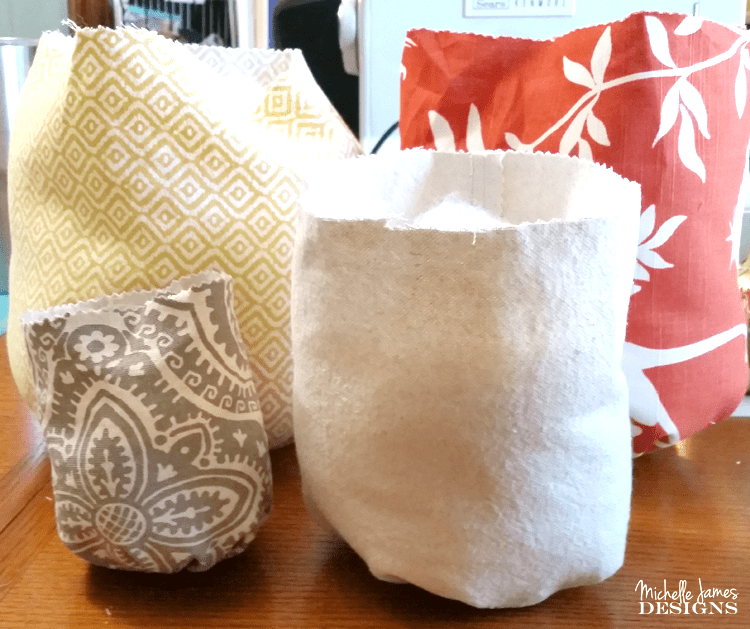 Thank you for the great idea on how to use up all of my fabric scraps. yay! You are welcome Debra! They were fun to make! I love this idea! 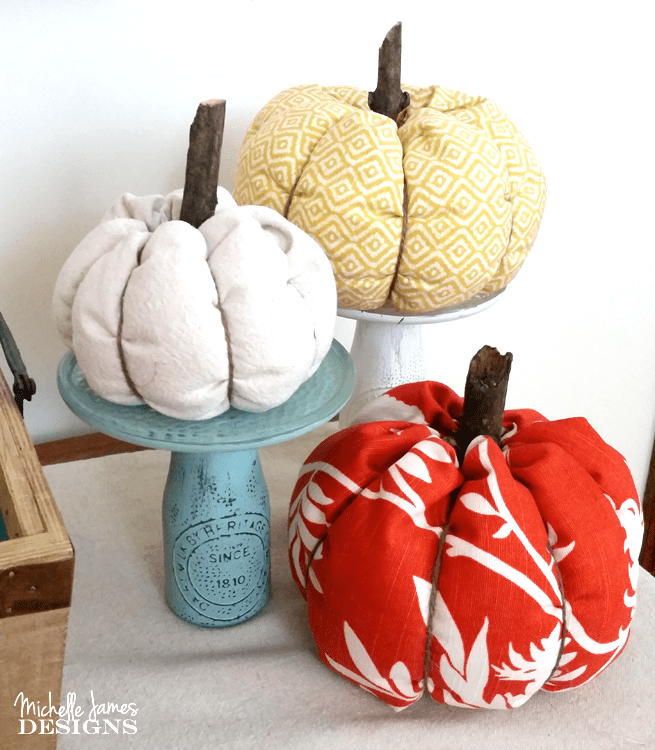 I saw these fabric pumpkins before but figured they take hours to make. But I guess not, huh? Thank you so much for this tutorial…definitly pinning it and writing it on my to do list! Hi Habiba! These really did not take very long at all. I was a little surprised myself. I needed them to be quick so I was glad it turned out that way. I am so glad you like them. Thank you. Hi Nancy! Thanks. I think the kids would have a lot of fun with these. Especially stuffing them. Even I think it is fun. 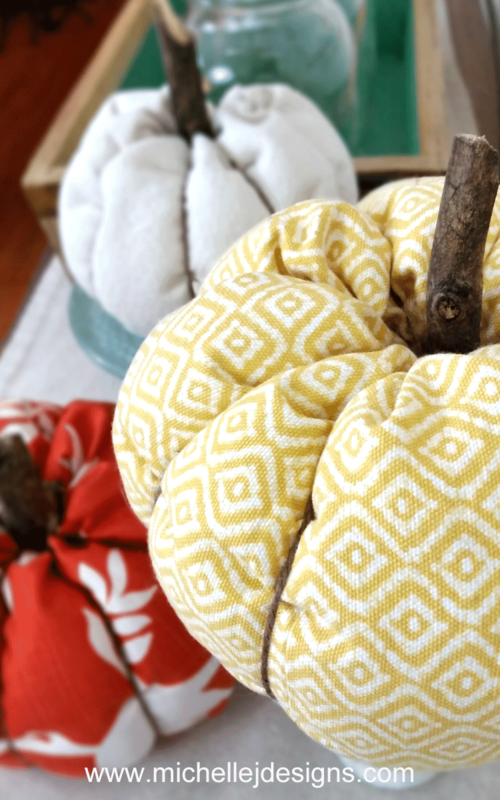 Fabric pumpkins are my fav for fall. They are so individualized, come in any colour you choose, and as fancy of simple as you like. This is a fantastic fall family craft and your tutorial is very thorough and well done. Pinning to my Fall Board. Hi Leanna! Thank you. I love just about everything pumpkin for fall. I am just not ready to let go of my summer warm weather yet. LOL! I pinned this project to make with my grand daughter. Thanks for the idea. LIke another commenter said, I thought they would be more difficult. I love the addition of a real stem. Hi Susan! I am glad you like them and I hope your grand daughter does too. They really do go together fast. Have fun! I did some of these years ago, I have no idea where they went to, I might need to make more, thanks for the reminder! Hi Emily. That sounds like what happens to me. I hope you find them. But if not these are fast and easy! These are sooo adorable!! Great destash and now you can use them every fall! Thank you Megan! They were so fun, fast and easy and I am excited about using them over and over. It is nice to have a stash of fabric! 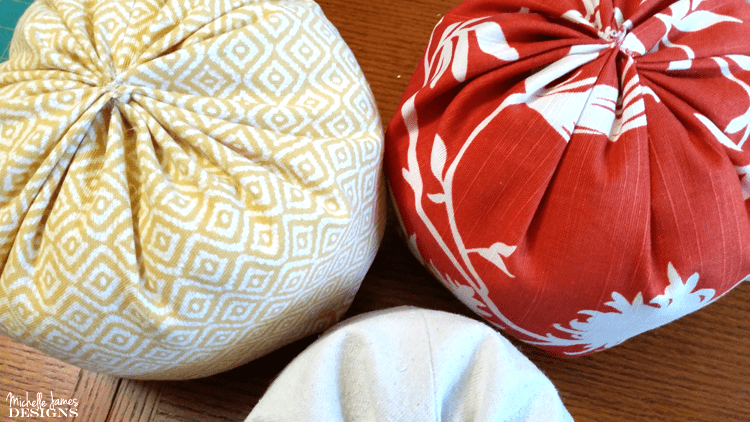 I have so many fabric scraps that could be turned into cute pumpkins – thanks for sharing with our Merry Monday party last week! Hi Emily! Fabric scraps really multiply don’t they. 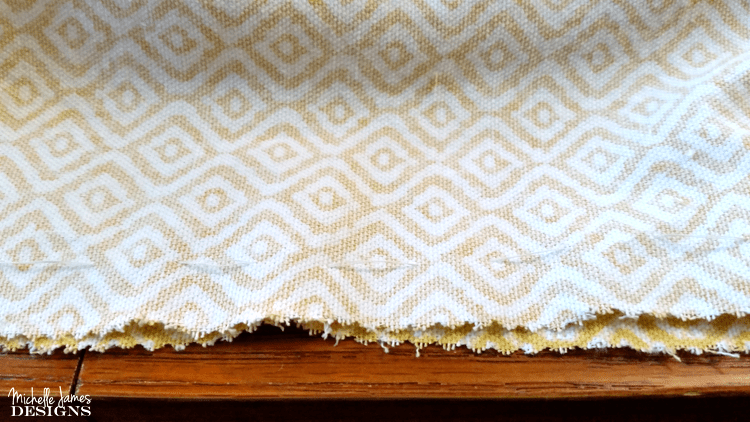 These are perfect for those scraps and I hope you make some! They were fun.